This is Priya from priya-n-papers. 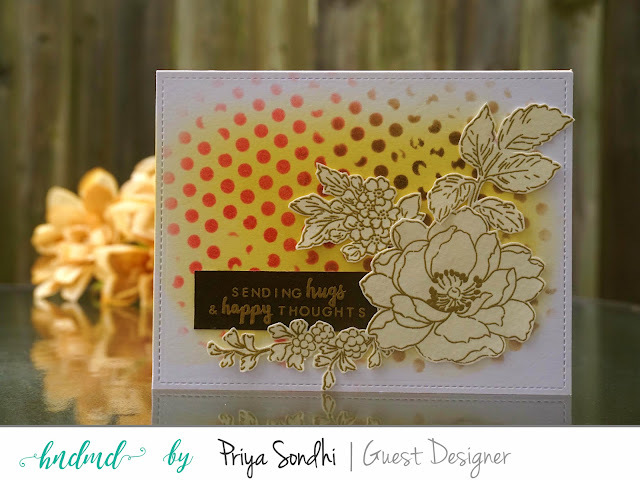 I am super thrilled to do be here at HDMD blog as guest designer to showcase some awesome made in India products! Khyati was so generous to send me few CrafTangle stencils so I churn up some gorgeousness out of it. 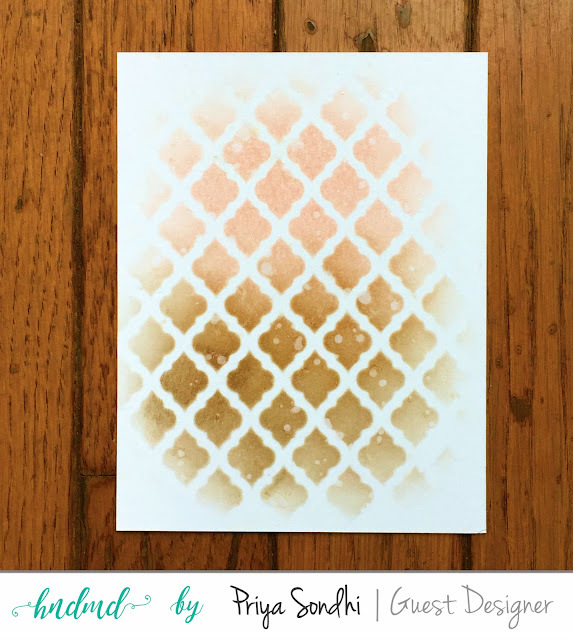 I came up with 3 different cards using Argyle, Moroccan Pattern and Dots stencils from HNDMD. All the stencils are high quality with so much details. I love the fact that these are 6x6 inches which is perfect for Mixed Media as well as card makers like me. I can easily create card backgrounds by using the stencil once to cover up whole A2 panel. Let's get started and let me show you each card one by one. 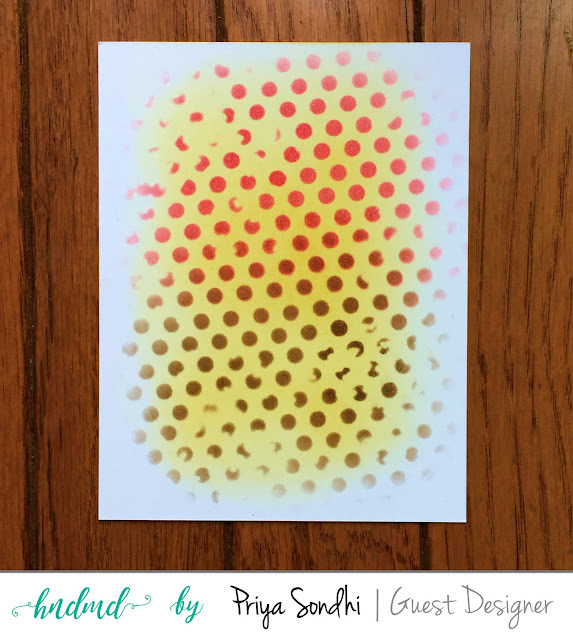 In all of my cards, I have created backgrounds using CrafTangle stencils by following various techniques. For this card, I first of all ink blended Mustered Seeds distress ink to cover most of the surface. The I used the Dot stencil and ink blended Picked Raspberry over one side of the stencil. On the other side, I blended in vintage photo distress ink. Here is how the background will look like. To finish off the card, I heat embossed the sentiment and the flower stamps from Altenew Beautiful Day stamp set. Here is a close up. 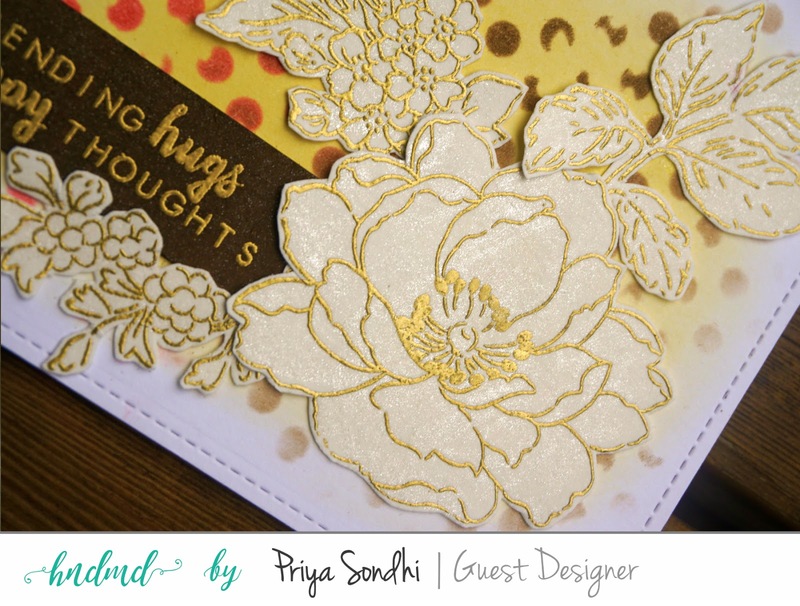 Those you follow my work knows how much I love heat embossing and I love creating heat embossed backgrounds using stencil. 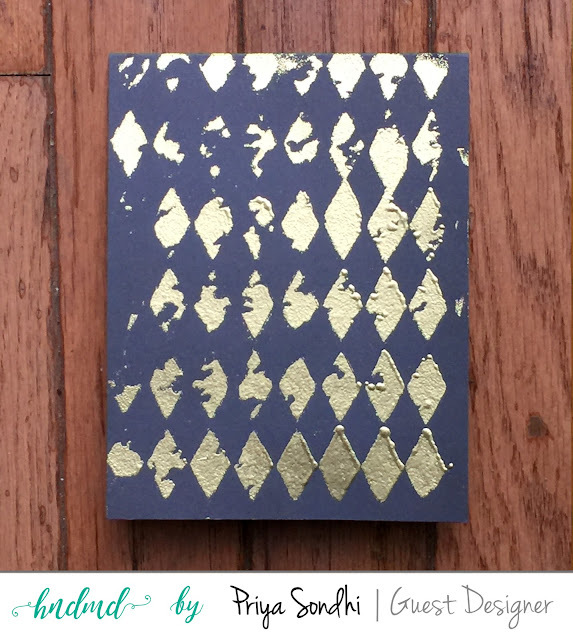 For this, I applied embossing ink over the cardstock using Argyle stencil. 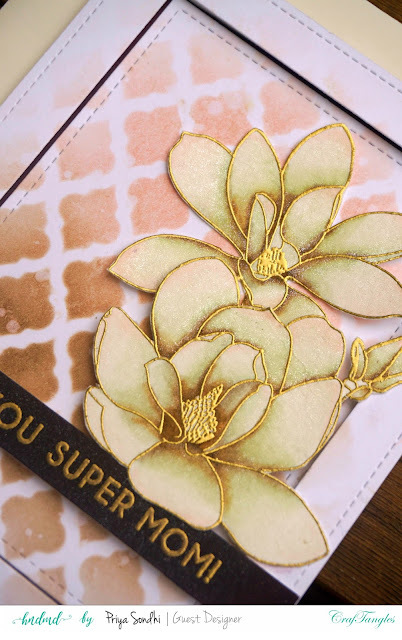 Then I removed the stencil and sprinkled in some gold embossing powder and heat set it. Here is the background panel. Isn't the stencil pattern so classy? 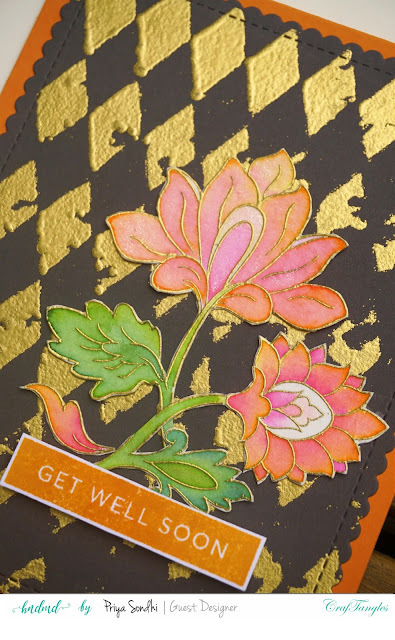 Here is the close up of the card that I completed by sticking in some colored Altenew Persian motif flowers. 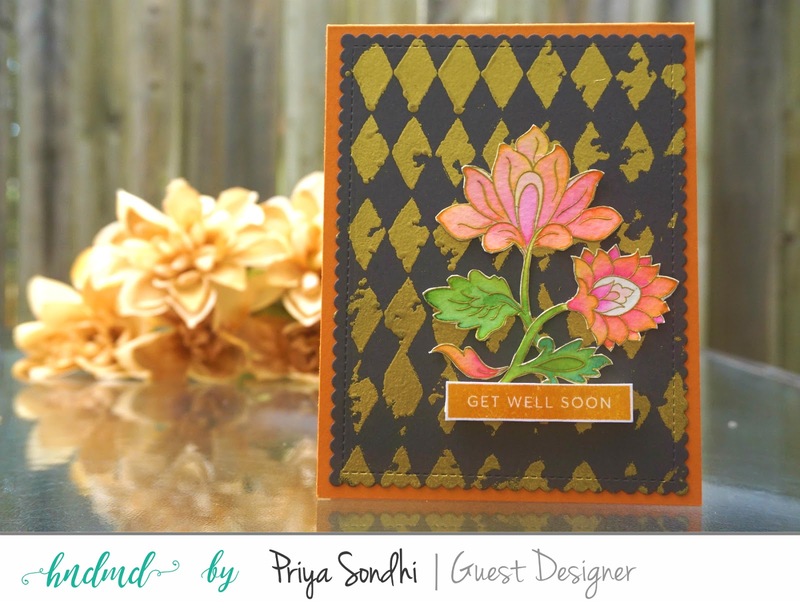 The elegance of the background is accentuating the non conventional colors of the card. This is the best of the lot! I am just not able to capture the beauty of this card. It's so pretty in real. Here is a close up ! I hope you liked my cards I made using CrafTangle stencils!! These are really beautiful cards !